Gluten free or not, you will love Gluten Free Summer eBook!! Who doesn’t love chocolate mint truffles and delicious salads?! I’ve teamed up with my friend Kimberlee again, who is sweet, fun and also a gluten free recipe expert! She’s been feeding her family a gluten free diet for eight years and her kitchen is overflowing with excellent recipes. 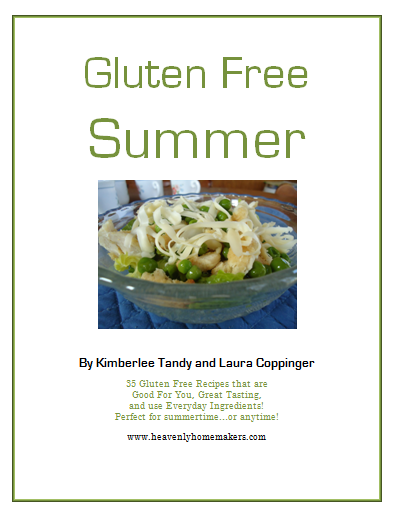 Because our Gluten Free and Good For You ebook was such a hit, I asked Kim to help us all out with her best tasting (and healthy) summertime dishes. And again, just like with our Gluten Free and Good For You ebook, all of these recipes call for normal, everyday ingredients. I wanted to be sure these were recipes that could be used by everyone at anytime, so that none of us have to turn somersaults to find ”special gluten free” ingredients many of us have never heard of. This way, even if you aren’t used to cooking gluten free foods exclusively, if you are hosting someone or feeding someone who requires a gluten free diet, you’ve got some great recipes that you know will be safe for them to eat! I love the idea of making hospitality toward our friends or family with this food sensitivity a simple possibility!